SAN FRANCISCO - Sept. 17, 2013 - PRLog -- Metis Makers brings sustainable fashion and locally made designs to San Francisco’s historic North Beach neighborhood. This premiere boutique combines the creative forces of Bay Area artisans who met at the slow-fashion incubator the 25th Street Collective (http://25thstreetcollective.com/). In Greek mythology, Metis is the mother of wisdom, craftiness and skillfulness. Each designer at Metis Makers creates eco-conscious styles with modern elegance. An artistic collaboration between Platinum Dirt ( http://platinumdirt.com/), Scorpion Sisters (http://www.scorpionsisters.com/), GhEttO GoLdiLocKs (http://ghettogoldilocks.com <http://ghettogoldilocks.com/> ), O'Lover Hats (http://www.oloverhats.com <http://www.oloverhats.com/> ), Myrrhia Fine Knitwear (http://www.myrrhia.com <http://www.myrrhia.com/> ), and Gneiss Wood (http://www.gneisswood.com/); each maker consciously creates their product lines locally in the Bay Area. Metis Makers will carry a beautiful blend of high fashion knitwear, leather jackets and accessories made from upcycled car seats, bold hats and headpieces, repurposed and edgy apparel, jewelry featuring reclaimed materials with a rock n' roll flair, and artfully designed gifts created from salvaged driftwood. 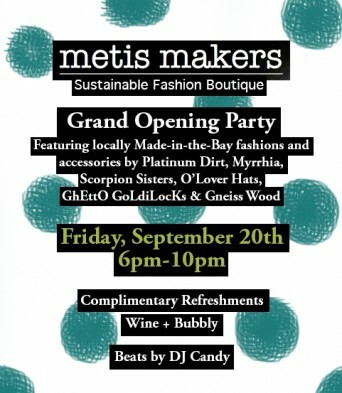 Metis Makers will be open on Friday, September 20th and the Grand Opening Party will take place from 6 pm to 10 pm. Customers are invited to sip complimentary wine and bubbly and enjoy beats by DJ Candy. Metis Makers is located at 1314 Grant Avenue, San Francisco, CA 94133.